With a minor 2% decline forecast, the 2017 insolvency outlook for advanced markets is stable. However, tighter access to financing and political uncertainty are putting pressure on businesses. This may be the reason why most respondents in Western Europe seem more inclined to sell on cash terms - despite the potential for losing sales to competitors offering credit terms. 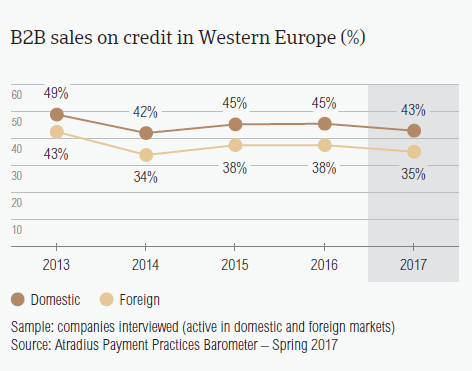 The use of credit terms for B2B sales by respondents in Western Europe decreased slightly compared to 2016, stressing the challenging business environment and increasing concerns of suppliers about being paid. On average, 42.6% of the sales to domestic B2B customers were transacted on credit. This is significantly higher than the 35.1% of sales made on credit to foreign B2B customers. All Western European countries surveyed seem to be more inclined to sell on credit terms to domestic B2B customers than to foreign B2B customers. 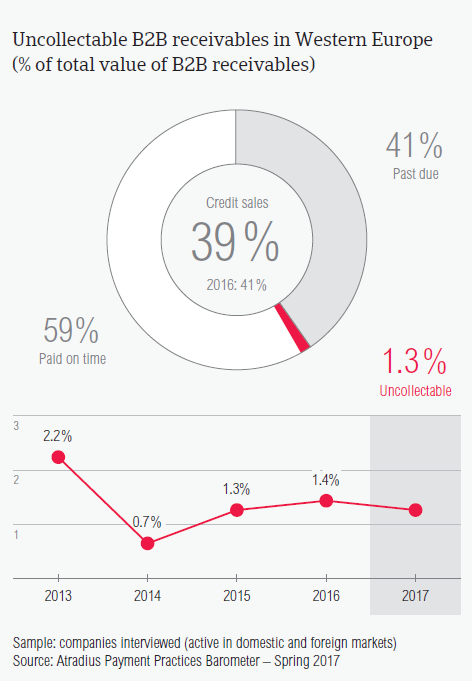 sales on credit compared to 2016. Ireland on the other hand, saw a modest increase. Respondents in Austria and Germany (26.5% each), and Switzerland (28%), had the lowest average percentage of sales made on credit terms in 2017. 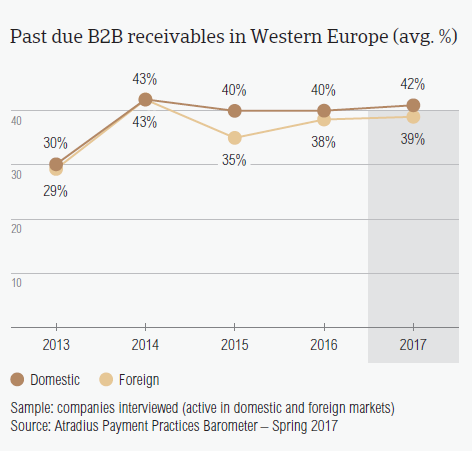 The percentage of overdue B2B invoices in Western Europe(41%) increased slightly compared to 2016 (39%), pointing to increased volatility. 91.4% of respondents in Western Europe (2016: 92.4%) reported late payments from their domestic B2B customers. This resulted in an average of 41.9% of domestic invoices remaining unpaid past the due date. At 84.2%, the frequency of late payments from foreign B2B customers is in line with 2016 levels. On average, 39.4% of foreign invoices remained unpaid past the due date. In Western Europe, late payments were most frequently reported in Switzerland (domestic 97%, foreign 93.9%) and least frequently in Sweden (domestic 81%, foreign 71.4%). Greece (51.6%) seems to be the country most impacted by late payments of invoices from domestic B2B customers. This is also reflected in the country’s DSO figure, which averaged 60 days, the longest in the region (Western Europe: average of 44 days). The highest average percentage of overdue invoices from foreign B2B customers was registered in Great Britain (49.9%). Despite this, the country has an average DSO figure (31 days) significantly below the regional average and the 2016 level (59 days), which may reflect greater efficiency in collecting high value invoices. Compared to 2016, average payment terms granted by respondents in Western Europe remained almost stable. However, payment delays from domestic B2B customers increased, indicating a slowdown in the speed of payment. 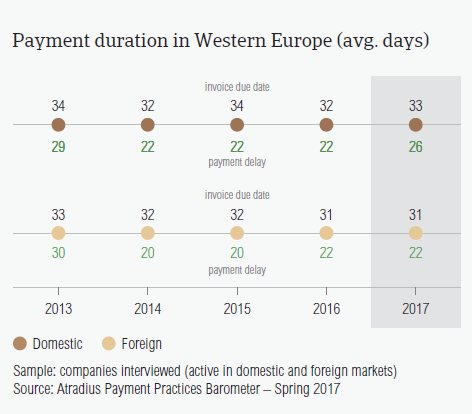 In 2017, payment terms granted by respondents in Western Europe averaged 32 days. With the exception of Greece (54 days), Italy (50 days) and Spain (45 days), all Western European countries surveyed granted payment terms of around 30 days or less from the invoice date. Greece has seen the biggest changes, with average payment terms extended by 10 days. With the exception of France, all countries in Western Europe saw an increase in payment delays from domestic B2B customers. This suggests that they may be more exposed to domestic than to foreign payment risks. The average payment delay from foreign B2B customers remained stable. In Greece, the average domestic payment delay is 47 days (11 days longer compared to 2016). Greek respondents have to wait 13 days (one week longer compared to 2016) for foreign past due invoices to be paid. A marked increase in payment delays was also observed in Great Britain (around one week longer for both domestic and foreign B2B customers). B2B customers of respondents in Western Europe delayed their payments most often because of liquidity issues but also for reasons unrelated to creditworthiness. 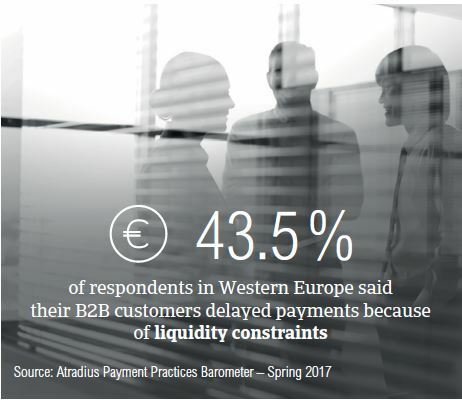 Like in 2016, B2B customers of respondents in Western Europe delayed payments most often due to insufficient availability of funds (43.5%), their buyers’ intentional use of outstanding invoices as a form of financing (26.1%) and the complexity of the payment procedure (24.4%). Italy (77.6%) and Greece (75%) are the countries most impacted by late payments due to domestic customers’ insufficient funds. Foreign payment delays driven by liquidity issues were reported most often in Austria (47.3%). Danish respondents experienced delays because of insufficient availability of funds the least often (domestic 21.4%, foreign 11.4%). However, they were the most concerned about the complexity of the payment procedure (domestic 27.2%, foreign 37.7%) and their buyers’ use of outstanding invoices as a form of financing (domestic 42.2%, foreign 34.2%). The perception that B2B customers intentionally use outstanding invoices for their financial advantage was also shared by Sweden (domestic 40%, foreign 39.7%). 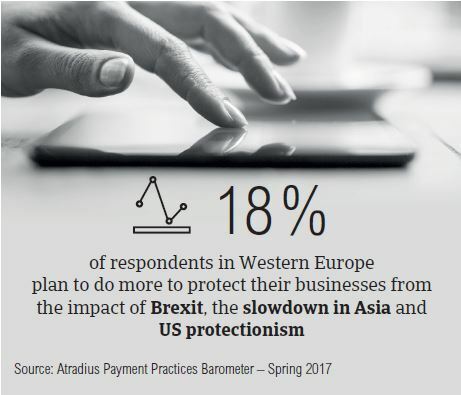 Around 18% of respondents in Western Europe plan to do more to protect their businesses from the impact of Brexit, the slowdown in Asia and US protectionism. Respondents in Western Europe appear to be well aware of the payment default risks that come with selling on credit. 48.3% reported they will continue using their current mix of credit management tools. 18% said they will increase their usage of credit management tools, mostly by increasing checks on buyers’ creditworthiness (23.5%) and by monitoring buyers’ credit risk (19%). Increasing checks on buyers’ creditworthiness (24.4%), monitoring buyers’ credit risk (20.9%) and increasing bad debt reserves (17.2%) were the most frequently mentioned practices employed by respondents in Western Europe to protect their businesses against the impact of Brexit. The management tools chosen by the most Western European respondents in respect to the impact of US protectionism were checking buyers’ creditworthiness (25.1%) and monitoring buyers’ credit risk (22%). The slowdown in Asia seems to be the least likely to prompt Western European respondents to increase protection and use of credit management tools. The proportion of B2B receivables reported by Western European respondents as uncollectable is 1.3%, under the level reported in 2016 (1.4%). Domestic receivables were written off as uncollectable slightly more often than foreign ones. However, with the exception of Greece and Italy, the average percentage of uncollectable domestic receivables was around 1% or less in all countries. In Greece, the proportion of uncollectable receivables (1.2%) was significantly higher than the regional average. However, it was lower than one year ago (1.8%). Uncollectable domestic receivables in Western Europe originated most often in the construction, consumer durables, and business services sectors. B2B receivables were reported to be uncollectable mainly because the customer went bankrupt or out of business (58.3%, slightly down from 59.3% in 2016). Respondents reported that write-offs were also due to one or more of the following reasons: high costs of pursuing debtors (24.6%), failure of collection attempts (24.3%), debts being too old (23.1%) and the inability to locate the customer (23%). An overall deterioration in payment behaviour is expected by 26% of respondents in Western Europe over the coming 12 months. Respondents in Western Europe extended the most lenient payment terms to B2B customers in these sectors: construction materials (39 days from the invoice date), machines, paper and textiles sectors (each with 38 days). The shortest payment terms were granted to B2B customers in financial services (27 days). 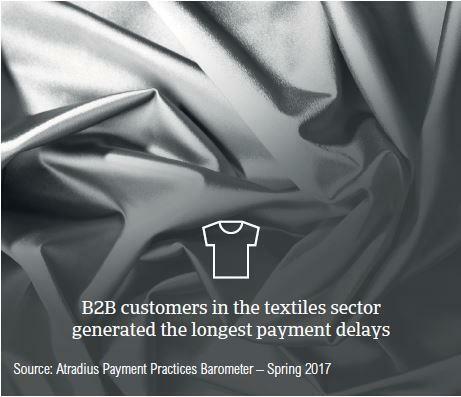 customers in the textiles sector take the longest to settle their payments (around 71 days). invoices for financial advantage (30%) and disputes over the quality of goods (14%) were most often reported by customers in the machines and paper industries. expecting deterioration than improvement (7.6%) in the payment behaviour of their B2B customers over the same time frame. Further sales growth in 2017 is uncertain as consumer confidence could be affected by the outcome of the presidential and parliamentary elections. Atradius forecasts insolvencies across advanced markets to fall only 2% in 2017, the weakest performance since 2009. Against a backdrop of heightened political uncertainty, the Dutch economy is holding firm. A centre-right coalition is the most likely outcome of the elections.